Dogs Chasing Inside a Donut Atom? My first experience in science was when I stuck my finger in an electrical socket. Later after I had grown up a little, I learned that electricity conforms to a three finger rule. Again a pointing finger but this time it teaches science, which cost some money. Point your index finger out and notice that your thumb is 90° to the pointing finger and the middle finger again 90° from the thumb. That gives you three axes all going into different directions. Electricians tell me it is a trade rule for explaining electricity, but I could use that hand rule and explain gravity as easy as pie. We know and have experienced three forces in nature, mostly invisible unless you repeat what I did as a kid with my finger in the socket! One is magnetism, the other shows up as a current in my socket I never forget, and if we pulse that current high and low we get something like a voltage, but I think it is converted to gravity, which also invisible but everybody has some different experience to notice. As a kid, I tested gravity by falling from an upstairs bedroom window and thereafter with a lot of commotion advised by my upset mother telling me to never, never do that again. Defying “Gravity” is worth the Nobel Prize and, since my bank account is negative always using physics, I learned the hard way. I visualize the smallest particles in physics having worked on the Stanford linear accelerator polishing klystrons, which looked like I was just working and not thinking too much when my boss came around. Sir Isaac Newton would agree with me also observing what happened. Exploding fog-chamber particles made my boss very excited, but I liked the donuts served at the party held near the cloud chamber after a successful test with the atomic gun still smoking. As a kid, I was always attracted to donuts. Now watching science explained in magazines has his rewards too and gives me hope that one day I would be elevated to the Nobel Prize even without a university degree not believing in unscientific evolution fairy tales but presented with a donut theory with laurels explaining gravity hopefully more scientific believable my schoolbooks forgot to tell. Imagine that my finger pointing in three directions represents invisible traveling rays of three energy levels not clearly defined by science yet either. Explain to me magnetism, or why electrons push another in a conductor metal, air or even vacuum thousand miles away from the source coming from a space station traveling through a vacuum as I can hear their voices and see pictures coming from the heavenly sky. I imagine the atom is not a ball with electrons circling around but invisible energy positrons bunched together inside a donut body creating a current with oscillating high and low voltage going around at the speed of light like a dog chasing his tail. According to the electrical hand rule, that motion produces magnetism radiating out 90° from the flow of moving current. My electrician’s three finger rule tells me that magnetism is produced by the positrons orbiting around the donut hole at the speed of light. They pass through the donut hole a million times a second coming around and squeezing the donut tightly similar to electrons circling around an old-fashioned atom ball concept, but in my theory the proton-positrons producing magnetism circle around and through the donut hole. If you can explain to me why the electrons circle endlessly around the nuclear ball - by what force, then I can explain my dog chasing the tail inside the donut. It is analogous to a cyclotron where a plasma proton beam is squeezed with magnetism. Every time a portion of the magnetic ray passes the donut hole, its magnetism will be squeezed and then expand on the other side happily pulsating, not being pressured but still forced again in the donut hole. Maybe a pulse-star could be an example of the early development of the donut-universe with a black hole. Conventional science stipulates that the electrons forever orbit the atomic nuclear ball center, but in our case it is directional around the donut hole or anticlockwise endlessly without friction. Now inside the bunched donut hole, another force emerges producing light just as my finger in the electrical outlet noticed touching the electrical socket but in my donut-hole we call it gravity more mysterious force scientist still postulating opinions with a difference they get paid for their opinions. Three energy forces put together like my three finger rule can be transmitted. We notice in a spectral analyzer that each one is on a different oscillating energy level, bunched together as some donuts are bigger than others. Or, the three invisible forces clustered become mass expressed as elements of the Periodic Table analogous to how invisible, vaporized water molecules re-appear condensed as droplets, which is another way a hidden mass is demonstrated. If two donuts come together, the gravity force in the hole gets two times bigger as they bunch together with magnetic force fields aligning in the same direction, forming a taller hole. Like two magnets stuck together produce twice the magnetism, a million donuts more press the donut body, which makes the dog cyclotrons go around chasing the tail faster. The moving dog protons form the donut body, which emits invisible energy as rays, allowing more donuts to pile on top thus creating more holes with gravity aligned in the same direction. Therefore, adding more donuts aligned at the center creates more gravity to become an invisible energy generator like a cyclotron seen in magazines. Remember, no magnetic metal can form at the thickest nuclear center of the sun or the earth. In my model, the resulting magnetism from proton dogs chasing their tails produces current that is converted at 90° angle to the chase, which in turn creates gravity. The forces get bigger when mass is added as the donuts align with three invisible forces compounding according to the three finger rule. Basically, I challenge the cornerstone of physics - the fundamental relationship between mass and gravity. Problems encountered in the undetected dark matter theory convince me that there probably is no such thing. As we try to define a universe and its laws, we assume that the nucleus operates under the same laws. Acceleration and deceleration of the speed of light seen in space should also apply to what happens inside of atoms, including my donut model. Remember that statement when I explain my model in more detail later. The donut model gets better. We previously learned that some atoms repel each other and some like each other. For example, gold does not want to spoon with oxygen. The electron magnetic rays passing though the donut hole is directional as a left turn is opposite to the right turn, which could explain their attraction. Or going into the hole clockwise, but if you turned the donut over then the rays would emerge opposite – counter clockwise, which would not like another donut lying on top also opposite therefore repelling forces. We label these forces positive or negative depending on how many donuts align themselves like when you have a girlfriend and are tired you just relax in spooning side by side. But watch out if one reverses position - I am talking about electron activity. The oxygen donut is usually a big man that needs two smaller sisters called hydrogen all spooning in the same direction. Chemists call it water or H ²O. It takes a little electrical energy to separate the two sisters, and chemists could advise me whether interjecting or replacing it with other sisters of different sizes now really messing up the party either spooning all together or repelling each other like a hippy party. Not educated in science and chemistry some valence relative is mentioned, which must be connected with the affinity another cousin like one sister has with big brother connected with the same family. Size of various donuts play out in physics like a cup of sugar mixed together with a cup of beans make not two cups but 1½ cup as the smaller donuts fit within the bigger donut hole spooning. Anyway, every time I pass the donut store I get the scientific itch in certain places and dream up all the possibilities so much fun to think about. I like analogies because they cannot be easily twisted to mean something different as we all share a common understanding and do not need a doctor degree. Now, we expand our concept and have fat donut looks like an Apple. Take an Apple peeler and remove the skin of an apple while it is slicing an endless curl like my daughters fashioned her long hair curly going out on a date. Then at the end remove the plug center and hold your apple in your hand. Have a good look at it and pull it slightly apart and notice the geometry of an inclining-declining curled slices connected with a donut hole in the middle and the ends look like a North-South pole. That will explain physics for my kids. To make you understand physics in the highest degree lets give our imagination free reign everything is possible in a fairy tale. But fairy tales have some wisdom which is for the other to discover. Our donut-apple is now sliced still hang together by slices curled connected round and round. Previously, I mentioned a dog chasing his tail. Each apple slice consist of a bunch of dogs chasing each others tail in a circle round and round with the speed of light. Let’s say the outer periphery of the apple has bigger slices which have more dogs let’s say 20 dogs chasing than the end slice smaller diameter only two dogs chasing the tail not enough room. The dogs represent a number of protons and as they are chasing the tail of the other dog-protons which a tail has less mass 10% of the dog body size. I consider the smaller mass-tail neutral (neutrons) separating the plus (body of the dog) from the plus another dog but are connected with the nose to tail small mass never catching up as they all going at the same speed around. So the invisible neutrons is missing body nose connected to tail chasing around the circle-apple slice. Therefore, notice on the North and South Poles [center of donut] was established by the apple plug removed, that caused a smaller slice of the apple donut on the ends; hence, smaller room only for two dog–protons chasing running around with the speed of light parallel to the other slice getting bigger next. To sum up, each slice competes with dog-positron pack side by side ending eventually like a wolf pack one group getting bigger with another one next chasing its neighbor’s tail. But as the slices getting bigger in a curl more dogs chasing the tail having more room maxed out on the largest diameter with perhaps 20 dogs in the wolf pack of the apple with the same hole. If we have a bigger apple-donut, we have more mass therefore more dog-protons. Like a Ferris wheel at the park, some energy pocket money is converted by turning people (proton) baskets spaced with small empty masses (invisible neutrons) between each basket around its periphery. When the wheel is turning, we notice the basket coming by while watching the girls like hot bunched protons screaming, which is cyclic depending on the speed of the wheel. It is not constant because it depends on the energy released. In this case, energy equals the money in my pocket to buy another ticket. The ride ends when my pocket is empty - no money energy left over. That stops the wheel like the time dimension stops to Zero like Taw. Two dogs chasing their tail on the smaller apple slice and 20 dogs on outer periphery would have different energy forces or velocities going around. It is easier to stop one car but stop a whole train has a lot more energy stored. On the outside North-South pole which is the entrance of the inside donut hole the dogs (positrons) chase each other with less speed of light because the diameter is smaller. But on the outer diameter of the apple donut we have more dogs going around faster with the speed of light causing a bigger inertia like a loaded train or flywheel more energy loaded. When light energy slows down sidewise to the next slice, it will be forced by the decreasing diameter from the bigger slice to a smaller diameter. Therefore, the excess flywheel inertia must go somewhere with the speed of light constant on the outer periphery but now is getting smaller in diameter hence that energy is squeezed kinetic energy released and converted in gravity by the square inside the donut center, which is a gravitational force squeezed outward like a toothpaste 90° out at the poles of the donut hole. Remember the three finger electrical rule. Light slowed down will increase gravity like a teeter totter, or gravity will slow down light explained by Dr. Einstein. To repeat, when a bunch of proton-positron dogs on the outer diameter of the donut goes around, we say its entropy is 100% as we can measure the speed of light. But when we go to the next smaller splice of the donut–apple, the second law of thermodynamics will apply a little less then 100% until at the smallest slice only 2 dog-proton-positrons in motion but with less stored energy running a shorter circumference distance. Hence slower speed of light as the excess energy from light must go some where being reduced not missing but is converted to gravity according to the teeter-totter principle. Running faster or slower sideways produces along the slices decreasing and increasing pulsating a certain frequency lowers and heightens the magnetism, but is positioned 90° from the dog-protons chasing the tail. That changing frequency based on the size of the donut and inertia is transmitted and seen as spectral lines in a spectral analyzer. Magnetism is really the in-between transfer force like a container terminal is transferring energy mass stored on a boat coming from China in container packages unloading its cargo. It is an invisible pulsating magnetic force and can become visible in a cloud chamber, iron filings or analogue when we see a racing car at speed over a dusty road, we see visibly the dust particles linked with motion of the car 90° to the going direction of motion. Gravity comes out from the hole either way like a toothpaste force depending how many magnet lines pass through the donut hole center. If a speeding train loaded with containers is stopped at once against a wall we would see gravity force expressed sideways 90° to the train of motion. The more dogs-protons chasing the more current is produced the more magnetism puts more energy stored-gravity in the center of the apple donut. 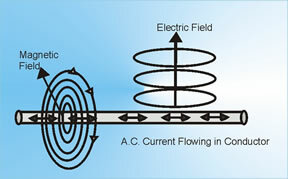 More magnetic forced bundled is electricity current a combination of forces three finger rule. Speed up the proton dogs on the outside apple nucleus to the speed of light you have gravity inertia produced from the dogs chasing the tail when it travels sideways toward the center of the hole getting smaller in diameter as bunched up excess energy must go somewhere expressing itself converted into gravity. The speed of light must be squared because it is going into two directions. One it goes around in the directing of the dog chasing. But there is another direction from one slice curl connected accelerating-deceleration according to entropy laws going across the apple from one slice getting bigger in the diameter and decreasing to the other side ending on the North-South pole. Therefore, squared light produces squared gravity (cubed). There is a time difference between the dog chasing the tail speed and the speed difference across the many curls from the North-South Pole side vise versa. For each mass (a big or smaller apple slice), we have a different time base squared speed of light or cubed gravity. A cubed gravity is the storage of the light energy-magnetism inertia potential between the slices summed up which becomes one whole nuclear mass added which as mass converted becomes energy seen in a rainbow color from space embedded spectral lines. To blow your mind a little further, years ago I saw a movie in Washington science museum which showed if every space is taken out from each atom to atoms then the whole universe would fit inside a one pound coffee container. That would not be to difficult linking it with gravity. Gravity slows down light like a teeter-totter. Gravity is the result of bunched [neutrons-protons] going around in a donut and oscillating with the speed of light producing Magnetism. Magnetism squeezed inside the donut hole, producing Gravity, which is converted energy coming from chasing dogs [proton-positron] inertia forming mass. Time is the difference of squared light 90° directed within the nucleus. Therefore time is slowing down in a parabolic curve too. The Time parabolic curve is affected by infinite light and is modified becoming finite (BC/AD) which can be measured but will return infinite when time ends in a negative infinite like a teeter totter or a flywheel loses its inertia when stopped is Zero time [Taw]. The rainbow teaches us that the energy finger imprint of every element in the periodic table is transferred even through space by a certain energy frequency we call spectral lines. How is it produced within our donut model nucleus? Spectral lines are a mixture of frequency married of gravity influenced by magnetism converted within the donut system. It is a pulsating energy like expanding and ebbing seen like the beach tides coming and going in cyclic motion from the ocean only faster as it connected with an expanding-contracting speed of light. Each donut element comes from a different ocean center or galaxy we see in the universe. To understand that have some fun with the kids interested in science and let’s take a piece of paper and scissors. Fold the paper in half hence doubled. Now cut out a circle 5-6 inch diameter which gives you two disks. Keep the disk together and cut a 1 inch hole now representing a donut. Now cut a spiral ¼ inch wide strip around, around toward the center to end in the hole. Separate the two spiral donut disk. Take one and flip it over 180° so the spiral goes in the opposite direction. Match the disk again and hold them together on the donut hole squeezed with two fingers. With the other hand, pull apart the spiral so we see two DNA spiral stairways, each going downstairs in the opposite direction starting from the enlarging hole. Then, focus on the cross over one going down and the other path going up, if we consider where the hole starts. Like a dog chasing another dog along the spiral path, one dog races upstairs from the big circle ending on the smaller hole going around a little slower and then goes straight downstairs in the same direction on the other spiral path chasing another positron dog. When they crossover seen very well in our paper donut model, energy is bunched because the dog proton repel each other not liking that something is in their path going in the opposite direction putting on the breaks to avoid a collision and spend a little extra energy creating dust 90° from the direction of the chase, which expresses itself like magnetism like a car on a dirt road leaving a trail 90° from the acceleration of a speeding car. To avoid a collision must repel a little and push sideways where we have room becoming gravity expressed as energy spent must go somewhere and must find a room not involved with the chase according to the three finger rule electrical law. That bunching break energy avoiding collision creates some dust magnetism a much smaller force the chase energy has embedded recognized as crossover pulses seen on my paper donut model depending on the size of the stairways and how many dogs chasing another positron dog tail crossing over. Spilled over energy avoiding a dog-proton is gravity getting bigger with spooning donuts on top of each other. We ne ed another analogy like two railroads are better balanced and explain again that infinite light slowing down will cause in a donut model with dog-positron repelling each other creating a current which can be measured and ending up in gravity. Look at the i nfinite math sign coming from an ancient pyramid hieroglyph embedded mathematics from before 2288 BC like a figure eight laying sideways ∞. Science before that time was more advanced then our civilization with superior genetic modification technologies and recorded mathematics without it could not have gone to space, read some of my Babushka books designed to widen our knowledge horizon. However, an asteroid destroyed that ancient Atlantis civilization leaving very little to make our scientist happy not recognizing the obvious biased in evolution fairy tales. The figure eight sideways looks to me like a toy racetrack I used to have as a kid. Wind up a bunch of toy cars running on a figure eight track and watch when they slam together on the crossover a typical demonstration of gravity produced with the car flipping over 90° to the direction of the track. Now imagine you put ten figure eights together interconnected on a long string closed loop, which now would get my father involved, cycling the cars exactly so that 20 cars running along the in and out track crossing over many times without causing an accident stopping the fun. Then continue thinking, connect 1,000 figure eights but squeeze the length down to 10% from its sides with the center having bigger circles getting smaller toward the ends like my apple donut slices compressed in a round apple again. The hills and valleys of so many figure eights compressed would look like a sine wave with getting bigger hills cycling with smaller and imagining cars (dog proton chasing) on a track racing synchronized avoiding a crossover crash. This configuration would produce electricity according to the three finger rule like a turbine with copper wire loops moving through magnetism. The amount can be measured and would look like the sine curve on your oscilloscope recognizing spectral lines indicating the presents of bigger or smaller donut element spooning summed up in our Periodic Table. Read that story again: it is the model at the core of my theory. Most elements are nonmagnetic; others are strongly magnetic. How is it produced within the donut atom? Look at the race track of figure eight car tracks. In my model, dog-protons take the place of the cars, or you can imagine dogs driving the cars. Either way, if they are squeezed together sideways to 10% across the apple donut, the set-up develops higher bunched or strong magnetism, as the small diameter to large diameter alignment of the apples slices is closer together. When they are further stretched apart, the donut shape is flat, which causes low magnetism where the atoms do not spoon together readily. The proximity of dog-protons determines the intensity of converted energy moving from one apple slice to the next getting bigger or smaller in diameter across the North-South diameter. More proton dogs bunched together causes extra magnetism like nickel-iron would demonstrate. Silver is nonmagnetic, and I would expect to see a flat donut as proton-positrons from the north-south pole race crosswise and show less intensity because they repel each other in the crossover. Iron in its natural state is usually nonmagnetic, but if you pass it over a strong magnet, the atoms align the next iron donut spooning with the next and thereby concentrate magnetic energy. Becoming a tall fat donut puts the center apple slices with a higher diameter closer together, which intensifies the magnetic forces as the time crossover is shorter. Longer time crossovers like with a flat donut produce less squeezed magnetic energy, which results in weaker, non-directional forces and behaves nonmagnetic. Watching a recent TV program (5/5/08) from the Geographic Magazine channel showed a frog suspended inside a hole levitated surrounded by a magnetic field. The frog has a large body of water which causes gravity to be suspended aligning the donut molecule spooning of the water molecule. Another typical application of a donut was demonstrated showing how to manufacture a huge donut magnet used in scrap iron separation or removal. An electrical current inside the coil produces magnetism at a 90° angle along the coil diameter selectively attracting only scrap iron separating it from the other debris. When the current is cut off the donut magnet becomes nonmagnetic again and lets the iron scrap pieces fall to the ground being no longer stuck by magnetism. Even the scrap metal pieces can be seen spooning, which matches expectations of the three finger rule. Check out the electric magnet in the scrap yard visualizing perfectly how my new donut theory works. I wish someone in graphics design could make a visual representation of my model with one dog chasing the tail of another, yet avoiding each other on a crossover. The number at the crossover depends on the size of the donut as the elements’ fingerprints are frequencies we see in a seven rainbow with spectral lines really has its origin in the Bible a scientific book par excellence. Revelation 4 reveals an embedded intelligence inside the rainbow above the Throne of God at the end of my crazy donut story. It reveals another mechanism to control the fuel converting either in an uncontrolled explosion scientist interfering with intelligence seen in an A-bomb or controlled watching the sun for 6,000 years. The process is the same. Before continuing to investigate the universe, we must further describe the chasing donut dog model. There is much to learn just like only 10% of an iceberg is visible above the surface. My technical expertise in atomic physics is similar to an iceberg, and I do not yet know its ramification of what God is telling me a page at the time. When you look at the element-particle reference table collected from Hyper and Quantum physics at the end of my book, there are 32 element names mentioned. They comprise a library full of books. Each is a specialty and very complex for anyone to understand. It is the work of thousands people spending a lifetime gathering information and seeing it from their perspective. Now in 2008 watching TV programs, it seems that the universe model is collapsing based on supposition on top of another false evolution religion which is failing in a new theory now “black energy” still using the same preconception. It is a meltdown of biased premises just another dead end. Let’s examine what the Bible has to say and compare my theory from a biblical dual railroad perspective. In my approach, we must first be clear on what God’s Plan for Humanity is. If we do not understand the blueprint for our existence, we will not understand the house we live in. God designed his universe house with embedded logic. That concept eliminates a lot unnecessary complexities postulated by atheistic science. Believing in outright lies and deception will never uncover the truth, no matter how much money is invested in billion dollar atom smashers or underground facilities to measure neutrinos. You cannot measure the material dimension of God’s breath expressed as life in you either. Secondly, God is the greatest designer and builder and uses very basic simple building block concepts like one brick builds a whole house with very few tools - only a plumb with a cheap string, a square, a pencil and paper with some handy math. Understanding from a simple faith perspective, we could determine how God was building his creation, but must look at his plan from an embedded Bible standpoint to recognized atom building blocks without which we have no universe. Using a Hebrew Alphabet Number System (HANS) of implanted concepts, most prophecies can be deciphered and explained how they fulfill the Plan for Humanity. HANS could also be applicable to decipher the mystery of atoms. It is a useful tool to unveil a donut atom mystery theory, too. Overlaying HANS, I recognized just two simple divisions seen everywhere in our physical world; therefore, I deduct it must be part of God’s Plan for Humanity. We have a Daleth dimension and a Heh dimension God’s original creation. Around that concept is like building a pyramid which comes together in Humanity at the top. Slice off the top we still have a shape of a pyramid replicating the Plan for Humanity like a smaller Russian egg is scaled and sits inside the bigger one and look the same. Do not forget the invisible purpose spelled out in the Bible, which is so simple because we have many illustrations in nature. God always replicated the invisible Heh dimension to strengthen our faith and replicated it in the Daleth dimension of our physical level of existence to help us understand what belongs to the other invisible side. It seems that God created a complex world but used very few building blocks like a brick has unlimited possibilities. Look at the DNA level only 4 cross strings A<G<T<G connecting two main trunks spiraling to give it strength like we do building tall skyscrapers. That gave us million genomes just buried in our physical body controlled with intelligence down to the very cell level. Than there is Daleth from the Hebrew letter and we can postulate from this what our world is made off, like four compass directions N-E-W-S and making it in a word which gives us more information watching TV now every night. That four square building block concept leads to a dual application expanded our thinking to the level of a donut atoms. I am sure that God made it simple and replicated the same laws within the atom universe to be reflected in the big universe just like a small egg with the same picture pattern is inside another bigger egg scaled with the same picture. The Bible is the biggest egg and therefore if we can understand the smallest part of his creation a micro cosmos like an atom and expand it to the universe or macro cosmos for interpretation. It will come together in one unified concept, but we must cross reference it with God’s Plan for Humanity, which gives us a design purpose without it we cannot understand the universe. If we dislocate anything from that plan we will get lost in controversies and paradoxes, which cannot be unified in any theory or have another religion and find some gullible simpletons to follow. A coin has two sides like Daleth-Heh, and all the appendix table element names can be put on either side as they all tell a little of something, only partially as most is just fake speculation to sell books to naive people. God made his universe simple if we understand the atom. I have given you a model extracted from the Bible, which matches the Plan for Humanity. Looking at purpose for Humanity and asking the questions of will it fit and will it make logical sense. Seeing the world from a dual railroad perspective gives us 360° vision which will teach us always look what is on the Heh or Daleth side. When we investigate the smallest energy particles, we must delineate where they belong like Daleth (this world in this time) or Heh dimension (the other side-heaven-spirit). Both have embedded energy levels each designed for a purpose. On the Daleth side, we have learned of a rainbow frequency with embedded spectral lines of every element formed and can be measured with a spectral analyzer and many other instruments. Then there is a rainbow over God’s Throne in heaven, which also has energy and intelligence like spectral line embedded but belong to the Heh dimension. However, we cannot measure those with our Daleth dimension instruments and must believe what God’s revelation is telling us about laws controlling the Heh dimension. Some are born skeptics have not learned to trust God needs some proof of the invisible. We must therefore use indirect methods like mathematics, logic; history observing nature replicated a Heh dimension as God gives us plenty illustration of what he created duplicating what is solid in the other side to match in our Daleth dimension. Like a seed in nature replicates the two stages for a future tree. The atom therefore is a replica of Humanity again seen in another illustration analogue like a butterfly first is the caterpillar stage than after the cocoon emerges the butterfly. A human person is designed on two levels very obvious and you do not have to be religious to recognize that we have spirit in us the primary function of high intelligence linked with an invisible life energy. We also have a physical body to experience pain and joy like Heh-Daleth dimension stretched across a past to a future. I call it the time dimension, which is not constant because it was designed on purpose. Atoms are intended to operate on two levels, which means they have two energy levels depending where the energy is directed (Heh-Daleth) and will match with the purposed design, too. The sun doles out energy in exact precise levels, or we would be history. A manmade sun (atomic bomb) lacks the intelligent control mechanism that conforms to the same energy laws; however, it doles out energy uncontrolled in seconds. When examining a donut atom, we must always look for the other side to balance out and must include purpose as all was created to be under one domain management which was later given to Adam and ended up with Satan. If you wanted to understand the universe, the ideas need to be crosschecked with the blueprint revealed from God the other side. I see two basic atom building blocks each dual in application reflecting the two dimensions. Since I am not educated in atom physics, I am theorizing a system of God’s creation that must match what we see and not speculate but must be crosschecked with God’s inspired Word. Therefore, I use similar particle names some scientists are familiar with so as not to create confusion. Only two elements are needed to construct a donut atom, but they must be dual in nature. First, I will use traditional science terms to give you an idea where we are going. Then, I will correct it to a biblical understanding as a whole concept. Looking first at physics that would match my donut atom, I identified similar particle elements that could overlay the two Daleth-Heh levels naturally in one particle. On the Daleth side, a positron becomes visible as a proton. Both are positively charged, and each could be halves of just one building block married together to make up half a donut atom. Then, we have an energy particle with its counter force, which is similar in nature also on two levels, to provide balanced polarity. In this case, an invisible neutrino is married to the neutron in a concept combination that is both neutral - no electrical charge - but linked to the Heh side of God’s creation. One connects with the earthly rainbow in the visible spectrum explained by a scientist Joseph von Fraunhofer. The other connects with the invisible rainbow in heaven Heh dimension described by John, not a scientist, but inspired to tell us about what is in heaven one notch higher educated. Both elementary concepts married together make a donut atom. When I checked out the other 30 sub-elements in the appendix table, they do not make sense to me, so I advise you to just ignore them to reduce confusion. The reason is obvious. Science is investigated from the wrong, atheistic religious perspective that can never produce reality. It is like scientist gather facts after a typhoon storm obliterated a house with fractured pieces strewn about and thereafter try to figure how each fractured piece would fit back into a design resembling a house never seen before. They build immense cannons acceleration guns to smash atoms and think that fractured pieces strewn about with broken elements would tell them a design theory matching element collected in the periodic table. The problem is there exist no plan or model for them denying the obvious rejecting the history of Humanity collected in the Bible. That would tell about a different perspective of the universe which could reveal what atoms where made off. A limited monorail perspective is very restricted only can move around in circles just keep examining more fractured particles and finding more broken parts being unlimited in size and shape, going around and around, writing thousands of books and never getting closer to real understanding – just like the dogs chasing each other inside the donut atom. I was not surprised to hear about another good one recently - a new “black energy theory,” which is now the mother theory to decimate another fractured theory previously explained. That will keep the cyclotrons busy looking for more particles, which changed the purpose of investigating science for those people only interested in high paying jobs and hoping for a pension. I will salvage what is still useful, unless God tells me otherwise, and have only use for two names of so many used in particle science. Let’s quickly copy some concepts believed by atheistic scientists before new books are printed and compare it with my hopefully, more sensible donut theory. The Big Bang model it is presumed that in early stages there were equal numbers of neutrons and protons since the available energies were much higher than the 0.78 MeV required to convert a proton and electron to a neutron. When the temperature dropped to the point where neutrons could no longer be produced from protons, the decay of free neutrons began to diminish their population. Those which combined with protons to form deuterons were protected from further decay. This is fortunate for us because if all the neutrons had decayed, there would be no universe as we know it, and we wouldn't be here! Think that through. We have equal numbers of neutrons (include neutrinos) and protons (include positrons) but need the invisible neutrons for the existence of the universe because the neutrons do not decay and kept coming from the source of the seven rainbow colors above the Throne of God in the Jod dimension. That said analyzing further where science got it wrong, I first question the big bang theory. It is not possible if you believe that entropy laws work. Read further. What caused the drop in temperature down to absolute Kelvin, as Kelvin temperature concepts demonstrate no energy moving, or all is dead? Who stirred up the dead into a big bang resurrected to get hot? Science tells me that a proton has a +1 charge like a positron. The +1 represents the polarity and the quantity of the charge the proton carries. The charge is one positive fundamental unit, or allegedly 1.602 × 10−19 coulomb. My Donut theory is upside down as the invisible neutron-neutrino is the energy source coming from the creator and is like the horse pulling the proton-positron carriage later explained. In my previous Babushka book I mentioned that there was an energy package embedded in every atom I called it the [+one], which represents a divine energy breath embedded from the Creator; Aleph in Hebrew means “one” mathematically. Without it you have no universe no atom no mortals as that is physics we can touch and measure. What is the distance from the proton to an electron if the proton was the size of a baseball? I am not sure how to do the proton the size of a baseball analogy, but if you make the whole atomic nucleus to be the size of a kid's marble, the first electron shell would be positioned slightly more than two miles away. Have some imagination just for fun. Typically positrons will thermalize, slow down, very quickly in a material. This means that they barely penetrate the surface of most materials. After thermalization, the positron will diffuse around the material, interacting with any defects, electromagnetic distortions or potential wells, they encounter. This may result in a change of the positron's state, collapsing its wave function and reducing the instantaneous chance of electron-positron annihilation. This will change the characteristic lifetime (in some ways similar to mean lifetime of the positron, which affects the lifetime spectra produced in experiment. If you understand that, you have my congratulations. You must be smart, but in my case God’s Plan for Humanity overlay is simpler. Just use and combine those two concepts [Proton-Positron] as one particle in my donut atom and forget what is confusing as we will just borrow the name and have a good looking simple Daleth particle only half of the whole and eliminate all the others, which are confusingly explained in hundreds of library science books. Neutrons really don't react with anything much other than atomic nuclei, which they slam into. This releases tremendous energy that can damage living tissue big time. And whether a neutron slows down (with the conversion of much of its kinetic energy into radiation that does severe tissue damage) or not, in the end, if it isn't absorbed by something (thereby activating it and making it radioactive), it spontaneously decays with a half life of about 15 minutes resulting in more radiation damage. Getting neutrons is something that should be done only with the greatest consideration. Again when neutrons slam into a wall that would be a problem as they will pierce heavy steel armors but slamming into moving atom proton flywheel apple slices would keep it running like we see the lights still on in every galaxy moving protons exchanging energy to magnetism to end in gravity forming elements to prove. As long the energy is absorbed in a moving proton atom nucleus it will not condense with radiation demonstrated in physics like a nuclear bomb. When we mess around with God’s energy quoting “This releases tremendous energy” which therefore proofs again that “life” the very breath of God is instant energy released in form of invisible Neutrons which is too high in frequency to measure and will give or take away life even going through thick steel tank armor. That discovery produced the neutron bomb but was abandoned as a weapon because it could not be controlled. The term neutrino was coined by Enrico Fermi, who developed the first theory describing neutrino interactions. The Italian name of the neutron seems to use one suffix even though it is a complete word, not a compound. Compound words in Italian indicate a large object whereas -ino indicates a small one. Neutrinos are elementary particles that travel close to the speed of light, lack an electric charge, pass through ordinary matter almost undisturbed and are extremely difficult to detect. As of 1999, it is believed neutrinos have a minuscule, b ut nonzero mass. They are usually denoted by the Greek letter ( nu). Most neutrinos passing through the Earth emanate from the sun, and more than 50 trillion solar electron neutrinos pass through the human body every second. (What a nice fairy tale I am impressed). There are three known types ( flavors) of neutrinos: electron neutrino νe, muon neutrino νμ and tau neutrino ντ, named after their partner leptons in the Standard Model. The current best measurement of the number of neutrino types comes from observing the decay of the Z boson. This particle can decay into any light neutrino and its antineutrino, and the more types of light neutrinos available, the shorter the lifetime of the Z boson. Measurements of the Z lifetime have shown that the number of light neutrino types (with "light" meaning of less than half the Z mass) is 3. The correspondence between the six quarks in the Standard Model and the six leptons, among them the three neutrinos, suggests to physicists' intuition that there should be exactly three types of neutrino. However, actual proof that there are only three kinds of neutrinos remains an elusive goal of particle physics. An elusive goal pointed out by intuition is not science but a fairy tale. Even Godly intuition requires a cross-reference of biblical perspective to be authentic. Satan also uses intuition so we must confirm our hunches with what God has proclaimed in his Word to make it genuine. Notice that gravity is the very last on the above list of forces, but everybody interacts with it daily just like the life-force in you. It should be the first on top, which leads to God who is Infinite Light, an energy source most scientists know nothing about. I am not surprised that, six months before the Apocalypse begins, science controlled by Satan proclaims Dark Energy linked to an atheist religion. His time is up, and his evolution fairy tales are experiencing a meltdown due to new discoveries that undermine evolution’s basic arguments. It needs replacement with another fairy tale to keep humanity ignorant. Dark Energy is now the major mystery of the universe. If you are confused or perplexed and worry of another snow job why pay so much money for opinions if they are not grounded on physics but depend on some author believing in an atheistic religion to be respectable. Therefore, let’s compare theories postulating assumptions which need to be checked out with logic. Let’s read about historic facts linked with other concepts and ancient knowledge from a 360° Bible perspective that will make sense and relate down to details. Proton-positron and neutron–neutrino are only four energy particles building blocks needed in a donut atom model both signifying Daleth-Heh dimension convergence ultimately linking the rainbow of earth with the rainbow in heaven. It is very simple to understand, even for my kids. Remember as you read further that the proton has two polarities. The same goes for the neutron, which makes four system directions. We see similar structures in nature like humanity’s four colors - white, yellow, red-brown and black. The ancient world divided the original elements into water, fire earth and air. DNA has four building blocks: A-C-G-T (adenine, cytosine, guanine, and thymine). Intelligence can perform four basic operations of logic: AND, OR, NAND and NOR. The biosphere has four kingdoms: animal, vegetable, mineral and spiritual. There are four gospels: Matthew, Mark, Luke, John and four seasons: spring, summer, autumn and winter. I am sure that you can find many more to add to the list. Time is a parabola as explained in Forum pearl #109, or check it out in the third Babushka book, Asteroid Answers to Ancient Calendar Mysteries: 2012, Aztec Pyramids, Antikythera & Other Ancient Calendar Clocks free on the Internet. Go to Section 4-The Atom as a Model for the Universe .